I hope everyone (who celebrates) had a wonderful Easter! I know, I’m a little late with this post… but I was sick so that’s my (lame) excuse. Actually, I was sick pretty much all of my spring break unfortunately. I didn’t even get to go to Eataly – the one thing I wanted to do over break! I just felt horrible but luckily, even though being sick stinks, I had the week off to get lots of rest. Anyways, now I’m feeling much better! Work started again Tuesday so I’ve been busy playing catch up but now I am finally ready for this blog post. My mom and I made these adorable Bunny Cupcakes and I just had to share them with you! I know Easter is over, but you can pin them for next year or use them as fun Spring treats or even for a birthday. These are very easy to make and they’re so cute you won’t even want to eat them. First, make cupcakes following the instructions from a box mix. They can be whatever type of cake you choose. Once your cupcakes are cooked and cooled you can start making the bunnies. Spread each cupcake with white frosting. We used cream cheese frosting. 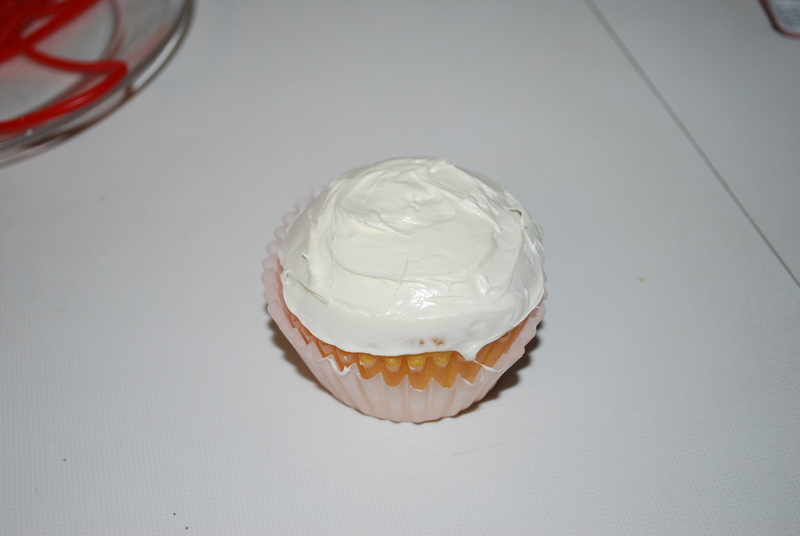 Then, put some shredded coconut in a bowl and roll the edges of your cupcake in the coconut. Don’t cover all the frosting with coconut because then the other goodies won’t stick to it! Just do the sides so that it looks like fur. For the ears, you will need large marshmallows. Take one and cut it diagonally to make 2 ears. You may need to stretch it out a little bit to make it look more like a bunny ear. Then place the marshmallows on the cupcake to look like ears. We sprinkled the middle of ours with some little red sprinkles to make them a little more colorful. For the eyes, place 2 M&Ms (M&M side down) on the cupcake. Finally, cut up pull-n-peel Twizzlers for the whiskers. We experimented with 2 and 3 whiskers so you can decide what you prefer! We thought they looked cute without noses so we only made a couple with little marshmallow noses. It occurred to me afterwards that pink jellybeans would make really good noses for these bunnies as well. It’s a cute little cupcake bunny army. This entry was posted in Desserts and tagged bunny, coconut, cupcakes, Easter, frosting, marshmallow, rabbit, Spring. Bookmark the permalink.